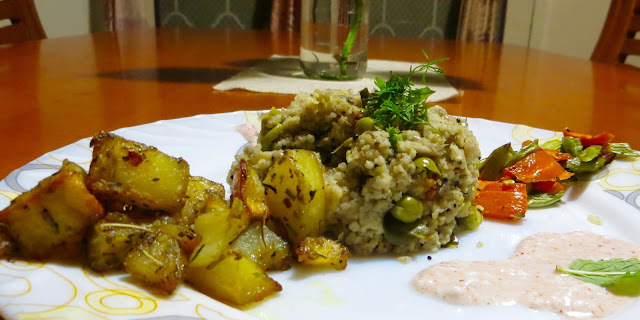 A very easy to make healthy platter, with millets as the core ingredient. As a side, there are grilled herbed potatoes, colourful veggies tossed with sesame in a wok, and a dip made with vegan curd. A wholesome vegan meal that can be put together in around 40-45 minutes. 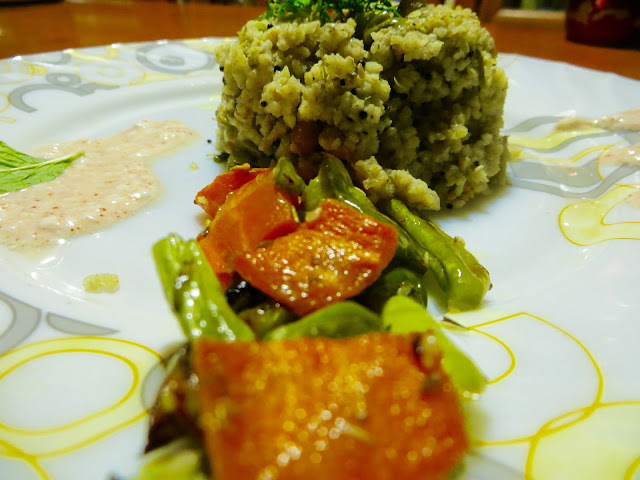 I have used foxtail millets for this recipe, however feel free to use any millets of your choice. Wash and drain the millets, and then soak in water for around 15 minutes. Meanwhile in a pressure pan, heat a little oil, and splutter the mustard seeds. Then add channa dal, curry leaves, ginger, dried red chillies, and sauté for a while. Then add the finely chopped onions and fry for a minute. Add the green peas next. Now add two and a half cups of water to the pressure pan, and let it simmer. Add the soaked millets now, and add salt to taste. Mix well, close the lid, and let it cook for 2 whistles. After opening the pan, fluff the millets with a fork, and top it with some freshly chopped coriander leaves. Heat some oil in an iron wok, and add the sesame seeds. Wait for it to splutter. Now add the chopped Veggies, salt and crushed pepper, and mix well. Saute the vegetables well on a medium heat till cooked and roasted. At this stage you may add a little bit of any sauce or herb if you like. I like the vegetables as it is, so didn't add any additional flavours. They can also be grilled in an oven. In a bowl take some oil, toss in some herbs like thyme, rosemary, etc., salt and pepper. Add the cubed potatoes and mix well till the potatoes are coated with the spices and oil. Set aside for a while. 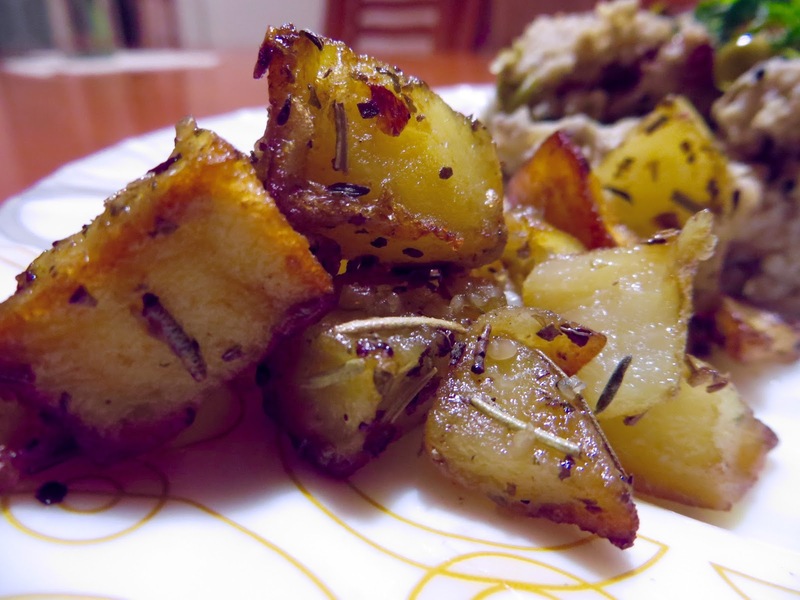 Spread the coated potatoes in a baking sheet. Grill in the OTG for around 20-25 minutes till they turn golden brown. For the curd dip, just add some chilli powder, salt and mint leaves to the vegan curd, and beat nicely till it turns into a creamy yummy dip. Arrange the millets, the veggies and the potatoes with the dip on a platter and enjoy! !